The WorkCast Platform allows you to upload registrations in bulk instead of using either a WorkCast registration page or one of our integration tools. In order to carry out a bulk upload you will need to request access for your account. Bulk uploads are done at session level and once you have uploaded a registration it behaves in exactly the same way as a registration created by any other format. As such bulk uploads will join the same workflow as registrations, sending out a details email straight away and also dispatching reminders emails as configured. Registrations should be uploaded as a .CSV file into the platform and should follow the same format as the registration report downloaded from the platform. 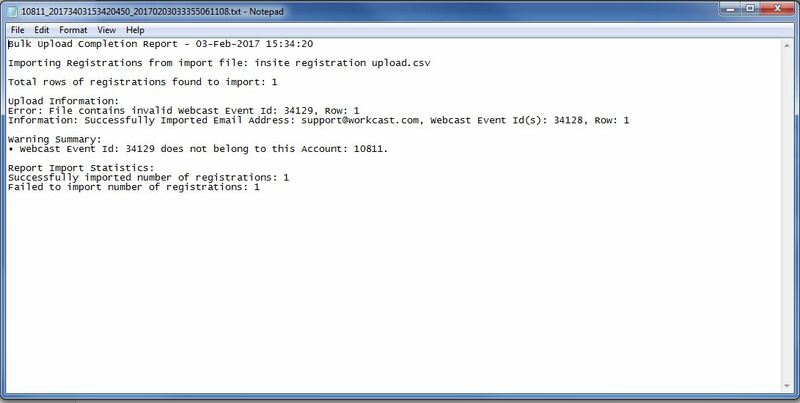 A WebcastEventId must be included with the registration upload. This lets the platform know which event to assign the registration against. Event Session ID can be found by navigation to your event, and within the 'Event Setup' tab, locate your session and click the information icon. If you wish to add registrations to more than one session simply enter multiple IDs into the .CSV file field separated by a pipe delimeter. All the standard WorkCast registration fields can be uploaded. In order for a registration to be valid an email address is required, all other fields are optional. Once you have created your .CSV file you can upload your registrations. 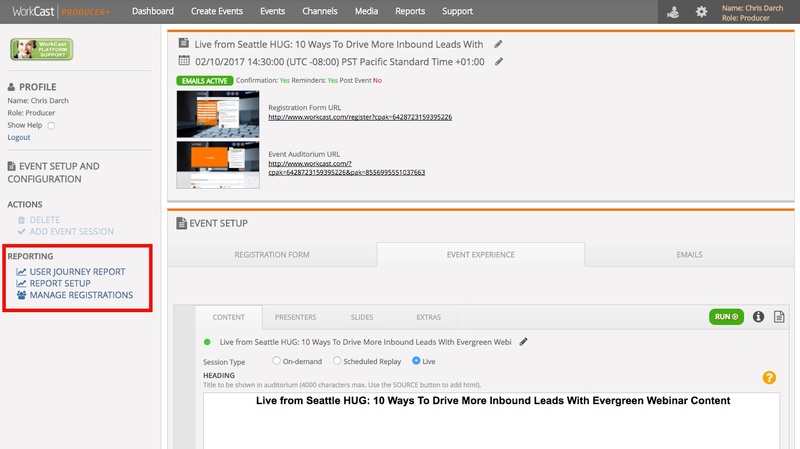 Within the Event Session Setup menu you will see a Manage Registrations option. Once in the Manage Registrants page you will be able to see all the users who have access to the event. From here you can also untick their access so the user is no longer able to gain access to the event auditorium. Within the Manage Registrants menu there is an option to upload registrations. Click through to here and follow the upload steps. You can review your upload history by clicking on the Registration History button in the menu. This will show you your previous uploads and their status. As well as this your registration import analysis report will also be available within the reporting tab of your account. This will allow you to download a text file with more detailed information about your upload. Please note: it is your responsiblity to ensure that the data you are loading to the platform complies with the relevant data protection regulations.